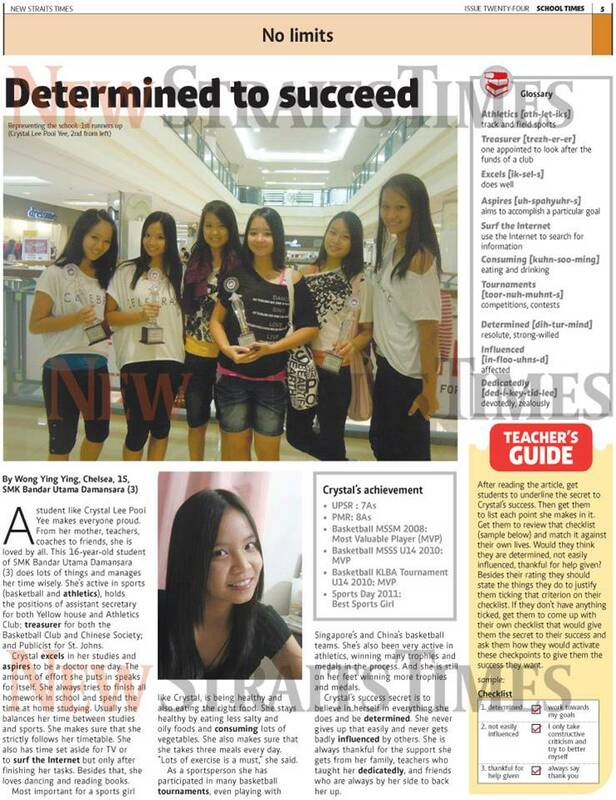 A student like Crystal Lee Pooi Yee makes everyone proud. From her mother, teachers, coaches to friends, she is loved by all. This 16-year-old student of SMK Bandar Utama Damansara (3) does lots of things and manages her time wisely. She's active in sports (basketball and athletics), holds the positions of assistant secretary for both Yellow House and Athletics Club: treasurer for both the Basketball Club and Chinese Society: and Publicist for St John's Ambulance. Crystal excels in her studies and aspires to be a doctor one day. The amount of effort she puts in speaks for itself. She always tries to finish all homework in school and spends her time at home studying. Usually, she balances her time between studies and sports. She makes sure that she strictly follows her timetable. She also has time set aside for TV or to surf the Internet but only after finishing her tasks. Besides that, she loves dancing and reading books. Most important for a sports girl, like Crystal, is being healthy and also eating the right food. She stays healthy by eating less salty and oily foods and consuming lots of vegetables- She also makes sure that she takes three meals every day. 'Lots of exercise is a must': she said. As a sportsperson she has participated in many basketball tournaments, even playing with Singapore's and China's basketball teams. She's also been very active in athletics, winning many trophies and medals in the process. And she is still on her feet, winning more trophies and medals. Crystal's success secret is to believe in herself in everything she does and be determined. She never gives up that easily and never gets badly influenced by others. She is always thankful for the support she gets from her family, teachers who taught her dedicatedly, and friends who are always by her side to back her up. Highlights of 2013: Teacher Oh Teacher! Highlights of 2013: Thank You! Highlights of 2012: Three Cheers for Malaysia! Highlights of 2012: On your mark, get set, GO! Highlights of 2012: Go, Lego, go! Highlights of 2012: Welcome back!